Skylights serve a variety of functions. In terms of savings, studies have shown that commercial buildings with optimally-designed skylights can reduce their energy costs by up to one-third. Most commercial warehouses nowadays incorporate skylights in their design to save on energy and power bills. Other studies show that daylight significantly improves the psychological and physiological wellbeing of an individual. It also revealed that classrooms that optimize daylights produce students with higher test scores. The established benefits of daylight on people, made possible through skylights installed on buildings and houses, are beyond question. If you are planning to install skylights on your Chicago roofing, or incorporate them in the design of your building to be constructed, you have to take into account several factors including the type of skylights to use (some are fixed while others are retractable) and materials for the selected skylights. The most common materials used on skylights are glass and plastic. 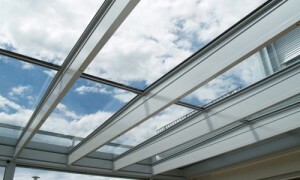 Most glass skylights today are composed of either tempered safety glass or laminated glass, or a combination of both. It is stronger than conventional glass by up to five times. When tempered glass shatters, it breaks into small oval-shaped pieces unlike ordinary glass that shatters into shards. Its ability to withstand heat is up to 1.5 to 2 times that of standard glass. Laminated glass is a type of safety glass that sticks together when shattered. Because of this safety feature, laminated glass is most often installed as windshield for automobiles. Two sheets of glass are bonded together by an inner plastic layer called polyvinyl butyral or PVB. The inner layer softens and helps absorb the impact on the glass, which are prevented from separating. This type of safety glass is not only widely-used as automobile windshields. They are also used in jewelry stores, hospitals, prisons and other places where security and safety are the primary considerations. An added advantage in using laminated glass is its resistance to Ultraviolet light. Low-E glass blocks heat entry into the building as well as heat loss through a skylight. It allows entry of daylight without darkening the interiors that comes from the use of laminated glass. Both tempered glass and laminated glass may incorporate low-e features in their design. A darker but more thermal-efficient version is found in Low-E 2 glass.